A Soyuz rocket booster failed during the launch of a capsule carrying NASA astronaut Nick Hague and Russian cosmonaut Alexey Ovchinin on Thursday, forcing officials to abort their mission. The capsule made a "ballistic landing" and rescue teams recovered the pair, who are reportedly in "good condition," NASA says. Hague and Ovchinin launched from the Baikonur Cosmodrome in Kazakhstan at 4:40 a.m. ET, heading to join the crew of the International Space Station. 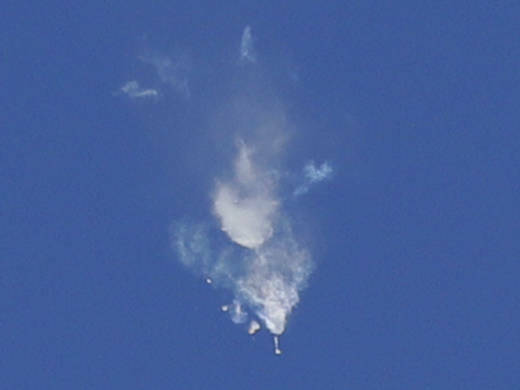 But more than a minute after launch, their Soyuz MS-10's booster failed. Search and recovery teams had been predeployed to areas beneath the possible flight path. Helicopters were able to reach Hague and Ovchinin fairly quickly and get them out of the capsule. They then started the process of flying back to the Baikonur Cosmodrome. Roscosmos, which oversees the Russian space program, tweeted a photo of Hague and Ovchinin being examined in Zhezkazgan. The two are seen sitting on a couch and appear to be in fine spirits. A NASA TV commentator at Mission Control Center in Houston describes a ballistic descent or landing as coming in "at a sharper angle to land than we normally land at. And that means that the crew inside experiences higher G-force loads as they go through the landing." "That is a landing mode we've seen before," the commentator said. A recording of communications between the space station and NASA stated that Hague and Ovchinin had experienced 6.7 G's — about the same as Apollo astronauts felt during re-entry, according to Air & Space magazine. A photo posted by Russia's Roscosmos space agency shortly before launch showed Ovchinin and Hague awaiting launch in their capsule — ready to complete two weeks of intense preparations and final tests at the Baikonur launch site. "I'm grateful that everyone is safe. A thorough investigation into the cause of the incident will be conducted," said NASA Administrator Jim Bridenstine, who was in Kazakhstan for the rocket launch. Roscosmos says it is forming a state commission to investigate the aborted launch. NASA says it chose Hague as an astronaut in 2013; he completed training in 2015 and had been scheduled to perform at least two spacewalks as part of his mission on the space station. He is a colonel in the Air Force. Ovchinin was heading to space for the second time, having previously served aboard the station. The two had been slated to join three crewmates on the ISS as part of Expedition 57. The trip to the station was to take them about six hours. The launch took place one week after three members of the ISS crew returned to Earth. Since then, the station has been operated by just three people: commander Alexander Gerst of the European Space Agency, and flight engineers Serena Auñón-Chancellor of NASA and Sergey Prokopyev of Roscosmos.